On Tuesday October 23rd 2012 opens CLUSTER II in SW1 Gallery (http://www.sw1gallery.co.uk), a group show with Brazilian, Argentine, Venezuelan, Colombian, Mexican and British artists, exhibiting in the second in a series of exciting mixed media shows in London. I am in the same room with Kate Bradbury, Rodrigo Souto Bueno, Christopher Campbell, Geoff Diego Litherland, Graham Carrick, Daniel Medina, Marcus Cope, Mauricio Fallini, Dominic Hawgood, Garry Hunter, Cipriano Martinez, Stephanie Moran, Gustavo Ortiz, Emily Wilcox, Adolfo Perez, Clare Price, Manuel Sanmartin, Lucietta Williams and Esteban Peña. This collective is being curated by Mas Civiles Manuel Sanmartin and Graham Carrick, together with Fitzrovia Noir’s Garry Hunter, Westminster Arts and the SW1 Gallery. As I m writing this blog, trying to have it ready for the Private View on Wednesday October 24th 2012, the show is all ready: all work hung, all the sculptures set and the floor scrubbed. It looks good. I am proud to have been invited. Sanmartin (http://www.masciviles.com) and Carrick work very well together, they know how to hang a show. 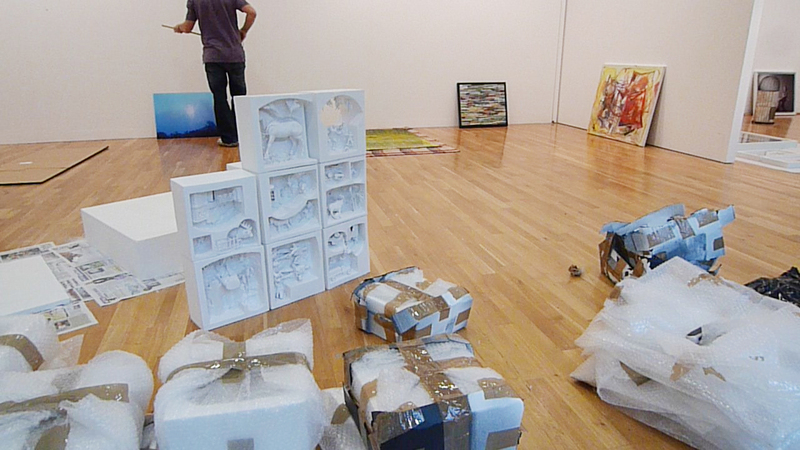 I like curators that have a natural talent for creating a dynamic dialogue among diverse works of art. And they do it so smoothly, no dramas, just the mandatory bucket of coffee and the bacon sandwich. Owen Ward, artist and director of the gallery, is amazing and such good sport, with that essential good eye for positioning work. I can see why he is at the front of this elegant space. On this occasion I am showing an old favorite (of mine at least), my velvet soldier from 2005-07, which I have shown at least in 5 other occasions. I said is a favorite work of mine because is still a seminalt work in my creative process. Here it is, in the best shot I had been able to take of it (with Owen passing by, handy to show the scale). It looks stunning, the space does it justice, at last! But I am very excited for the other work also. 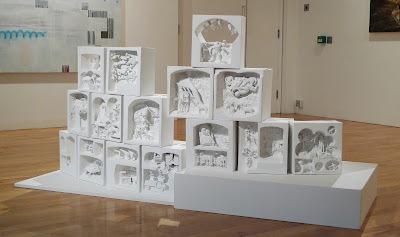 They are 23 individual plaster sculptures, that I started making 2 months ago. The making was really intense and difficult, a constant fight with the technique. I had to learn as I went along, so the first pieces are extremely fragile, while the rest got stronger as I proceeded. People keep asking how I made them. And I respond that is good I am making a video that hopefully will shed some light over the process. These pieces are in all sense the continuation of my very first sculptures, the ones I made in the art school that I call concrete paintings. These later pieces are the better, more sophisticated version of those first sculptures. How do I start? 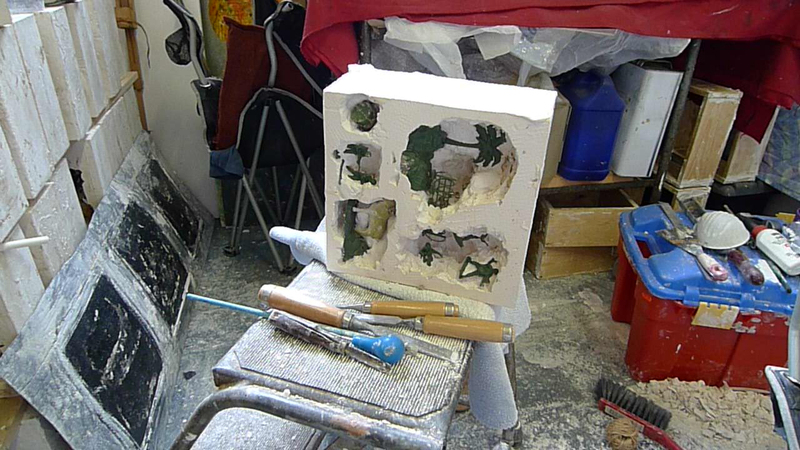 I use a wooden mold / frame, 13 cm depth . This mold goes on the floor on top of a protective material. 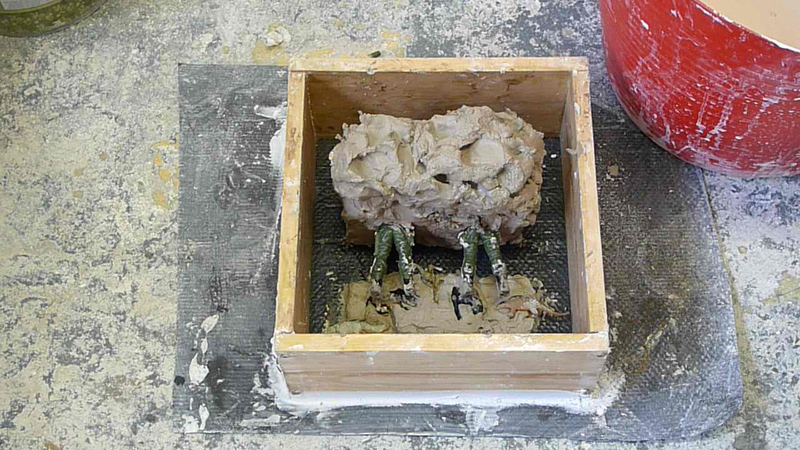 Inside this frame I made a composition using clay and toys. 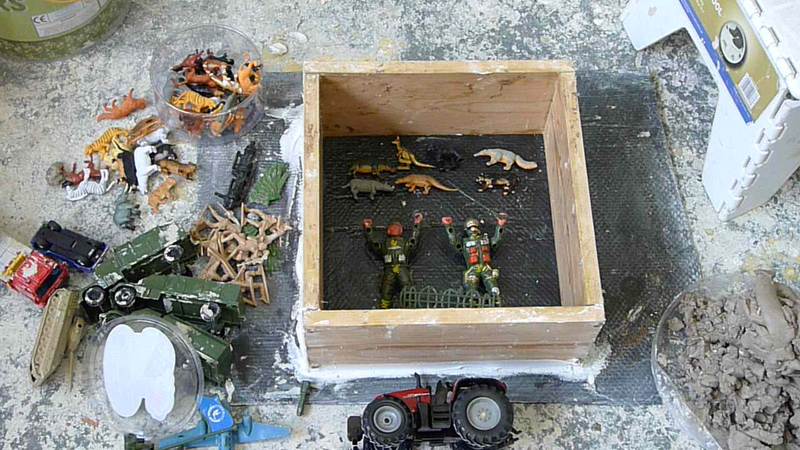 I trap the toys in the clay, half way in the clay, in order to trap them with the plaster once I pour it in. This composition is a negative of the final result. I sealed the edges of the bottom of the frame using decorators caulk, so the liquid plaster wont escape when I pour it in. 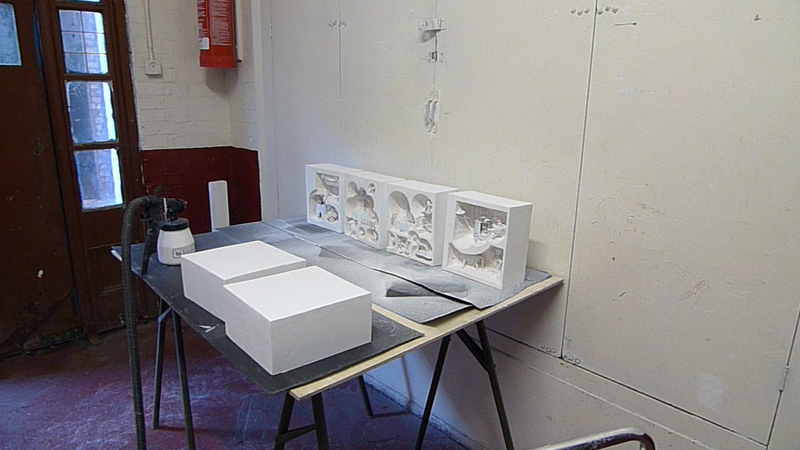 I prepare the plaster and add 1 part of white Portland concrete, in the hope it makes the pieces a bit stronger. I pour the mix in and let it dry. 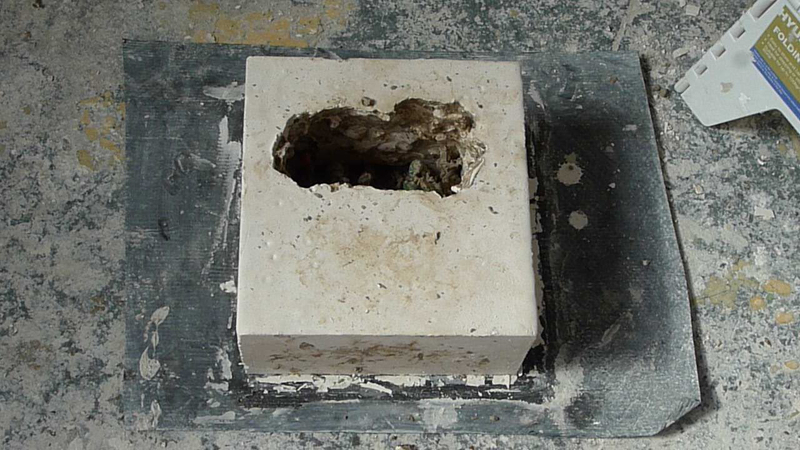 The next day, depending of the weather, I take the frame off and turn this white box of plaster over, upside down. 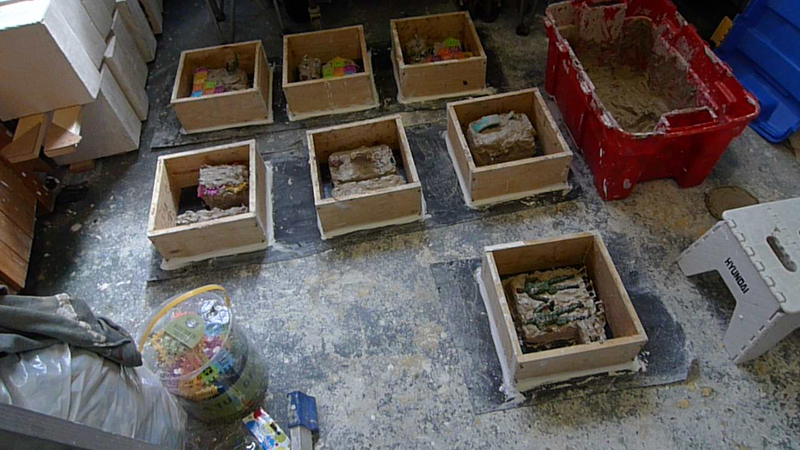 What I have them is a blotch of clay in the middle of a box of plaster. I proceed to take the clay out, taking great care to trying to remember what toy was where, so I don't break them o pull them out accidentally. I wash the piece and clean as much as I can. 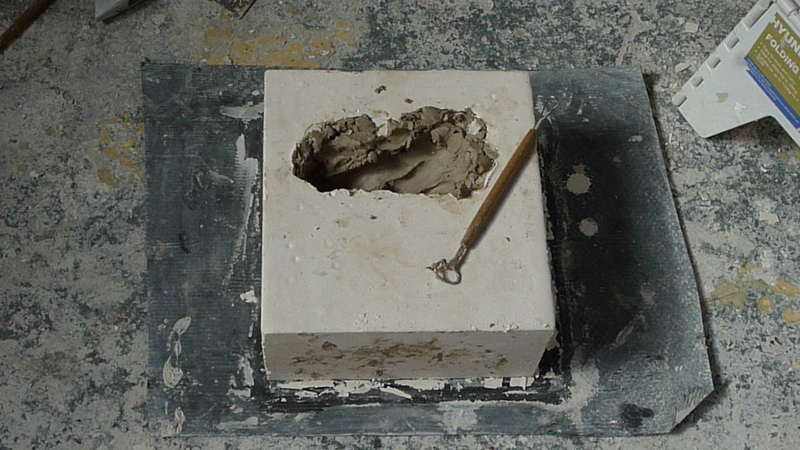 Another day, once is a bit dryer, I look a this hole or holes left by the clay and proceed to try to make sense, geometrically speaking, of this cavities. 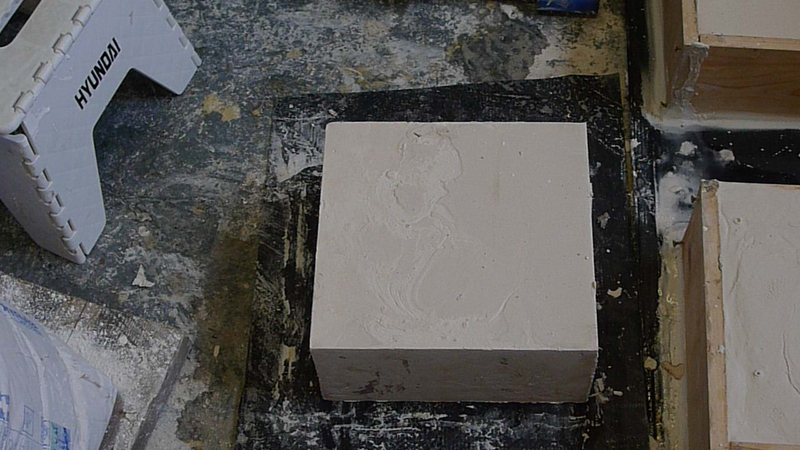 I carve using a small chisel, sometimes I hammer a bit but most of the time I use the chisel pushing with my hands. 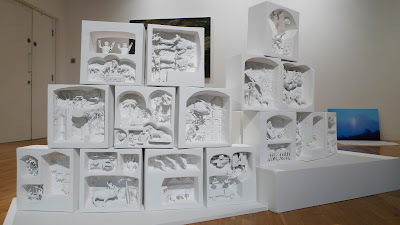 As I carve there is inevitably a sense of a archeological excavation of sorts, or the shaping of a house, making door frames, windows, portals and arches that themselves frame the toys. The toys appear to be in a permanent confrontation, which each other, with themselves. 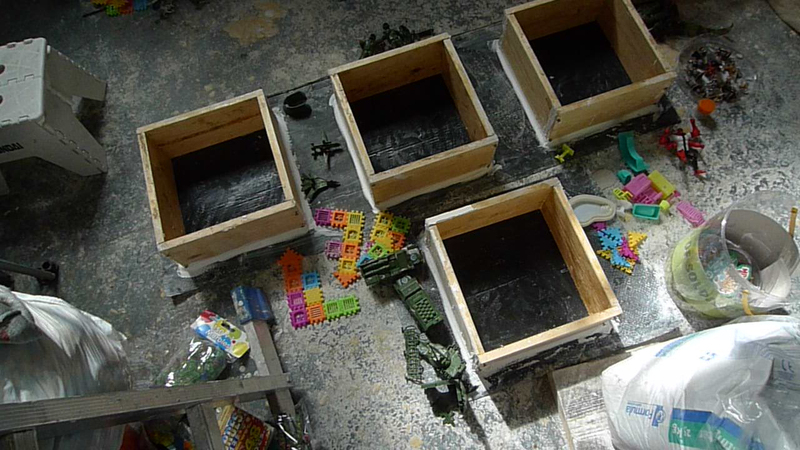 I sand the pieces and use filler to make the surface very smooth, and undercoat the toys, and spray-paint all using masonry paint. And more often than not, the sculpture breaks here and there, and I try to incorporate the breakage into the final product, transforming the accident into intention, since I know once the all pieces are all together, these unespected cavities will create negative spaces very valuable to the whole composition. In order to show all the pieces I had to literally play with them as building bricks, taking the time to find out which combination works better. The images show only the composition that receives the public in the gallery. But there are sculptures also on the other side, like a double brick wall. I decided to add some more text to this blog, after had lived through the Private View. I want to register the public reaction towards these new sculptures of mine. 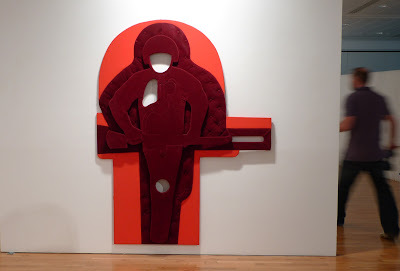 As they were positioned right by the door of the gallery, they received the public when they enter the space. 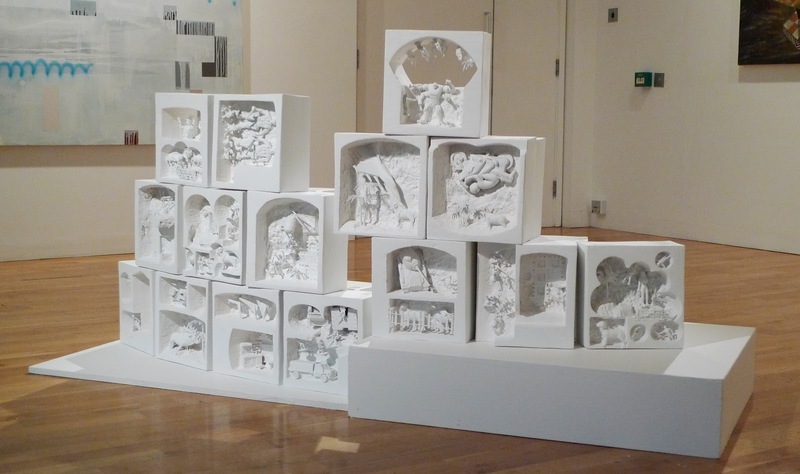 More often than not, people feel compelled to approach the small wall of sculptures and, since they are quite low, almost on the floor, people also kneel and express great curiosity (I think) towards the detail of the pieces. They don't know there are toys in these sculptures, I guess, not at first glance, and some think all has been cast in plaster or else. They are technically very intriguing. The people then move around, usually "reading" the group right to left, and continue to inspect the composition at the back, which contains less pieces. I had he opportunity to talk with some members of the public, puzzled as they were about technique and intention behind the sculptures. Since I usually shy away from revealing too much of what lies beneath of what I do, i do concentrate on talking about the technique, which in this case, has provoke a lot of questions. But then I realized that as I was on the floor with members of the public, they became playful, recognizing the toys they used to play with. They connected with my own time playing with the toys while I was doing the compositions with clay. I realized that my playfulness came through and reverberated even in the gallery.